Legislator Shane Broadwell, District 17, was voted in as chairman of the Oswego County Legislature at the 2018 organizational meeting. 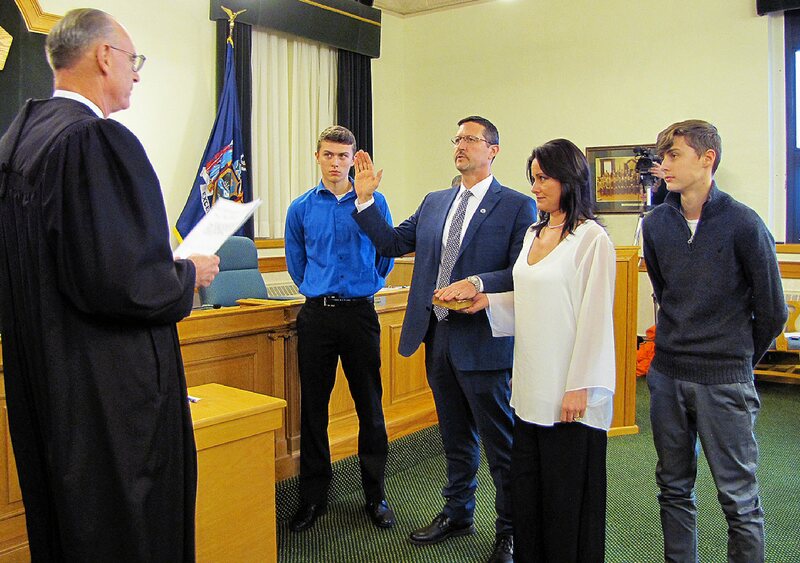 Family Court Justice James K. Eby administered the oath of office while his wife, Elisa, and his sons, Sam (left) and Matthew (right), look on. 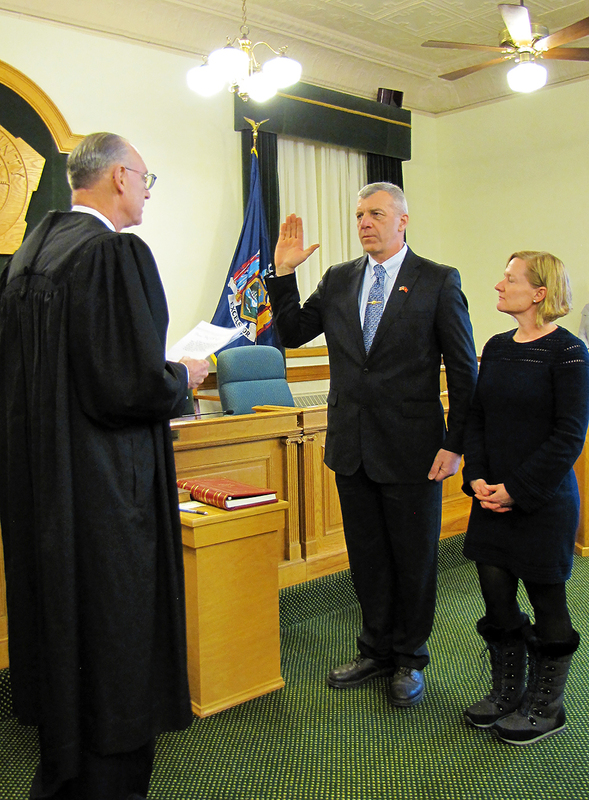 OSWEGO – The Oswego County Legislature elected District 17 Legislator Shane Broadwell as Chairman of the Legislature at its organizational meeting Jan. 4. 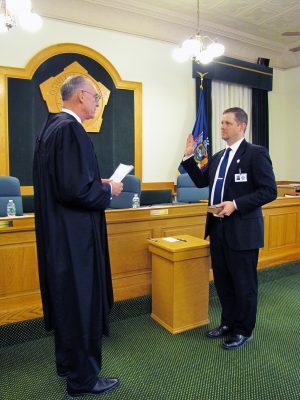 Broadwell has represented portions of the city of Oswego and town of Scriba on the Legislature since 2012. Oswego County Legislator Linda Lockwood, District 11, recites the oath of office before Hon. James K. Eby, Family Court Justice, after being re-elected Legislature vice chairwoman. Legislator Terry Wilbur, District 21 holds the bible. He served as chairman of the Legislature’s Finance and Personnel Committee and as legislature majority leader in 2017. Legislator Linda Lockwood, District 11, Volney, was re-elected Vice Chairwoman. Christopher Jones was re-elected Clerk of the Legislature. 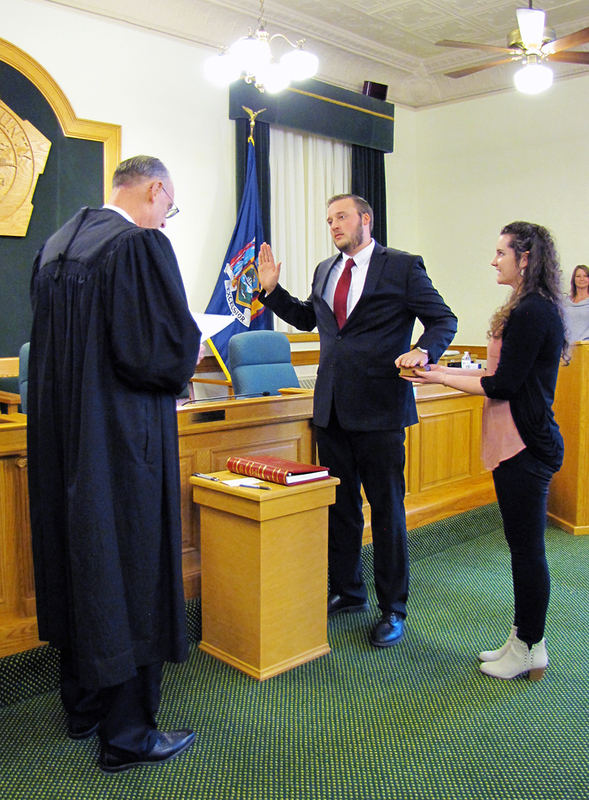 Oswego County Family Court Judge James K. Eby administered the oaths of office. Four new members of the Legislature were sworn in. 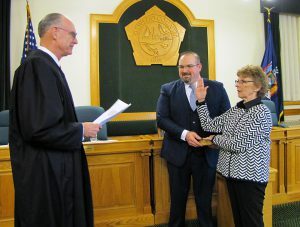 Bradley Trudell, District 7, represents residents in Mexico and part of the town of Richland; Mary Chesbro, District 10, represents portions of Schroeppel and Volney; Patrick Twiss, District 13, represents the town of New Haven and portions of Palermo and Scriba; and Nathan Emmons, District 15, represents part of Oswego’s west side. Incumbent legislators also took their oaths of office. The Legislature’s next regular meeting is scheduled for 2 p.m. Thursday, Feb. 8, in the Legislative Chambers of the County Office Building at 46 E. Bridge St., Oswego. Hon. James K. Eby, Family Court Justice, administers the oath of office to new legislator Patrick Twiss at the Oswego County Legislature’s 2018 organizational meeting. He is joined by his girlfriend, Elena Oldenburg, holding the bible. Legislator Twiss represents portions of New Haven, Palermo, and Scriba in District 13. Bradley Trudell takes the oath of office for the District 7 seat on the Oswego County Legislature, as his wife, Allison, looks on. Family Court Justice James K. Eby swore in new legislators at the 2018 organizational meeting. Legislator Trudell represents portions of Mexico and Richland. 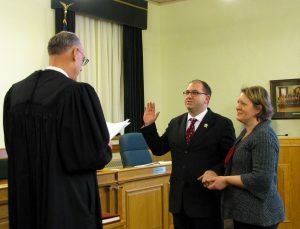 Legislator Nathan Emmons, District 15, is sworn in by Family Court Justice James K. Eby as his wife, Lisa, holds the bible. Legislator Emmons joined the 2018 Legislature at the group’s organizational meeting on January 4. He represents portions of the city of Oswego. 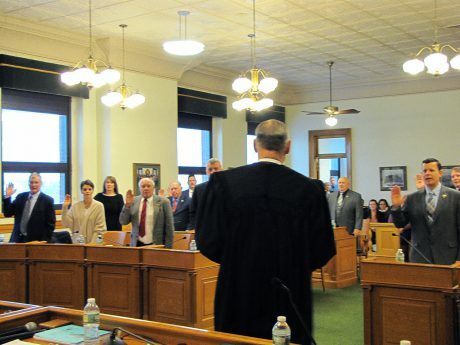 New members of the Oswego County Legislature took office at the organizational meeting on January 4. Legislator Mary Chesbro, District 10, Schroeppel and Volney, is sworn in by Hon. James K. Eby, Family Court Justice. Chesbro’s husband, Earl, holds the bible as her daughter, Jessica Hoyt, looks on. Chris Jones begins his second term as clerk of the Oswego County Legislature in 2018. 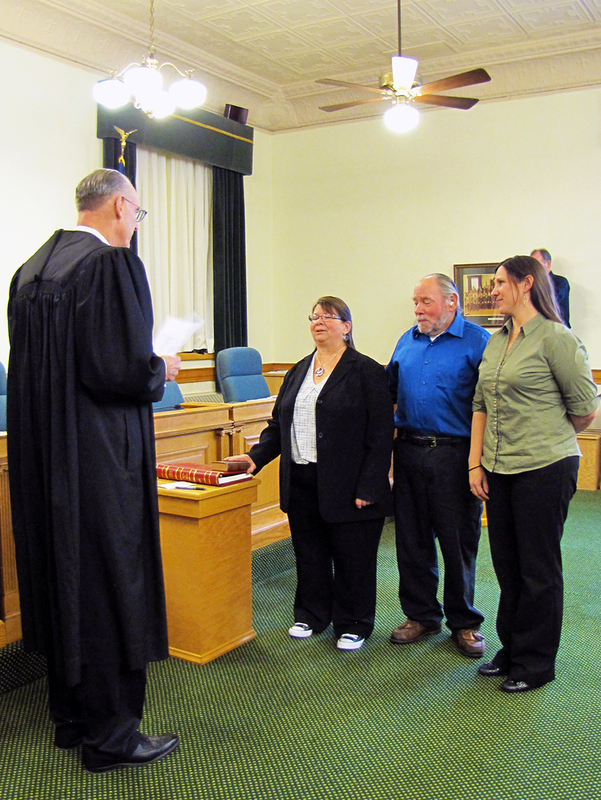 Family Court Justice James K. Eby officiated the oath. Oswego County began 2018 with incumbent members of the Legislature renewing their oaths of office. Family Court Justice James K. Eby presided over the oath during the group’s organizational meeting on Thursday, January 4.